Many of us reuse our Easter baskets year after year, but we don’t always have an extra basket on hand to give as a gift. And who wants to spend money on a basket the recipient will stash away in the attic or maybe donate to Goodwill? Not me. So building on my previous post about Great Grandma Case’s crochet butter tub cozy Easter baskets, here are some more alternatives to tradition. When I look for containers to use to gift Easter goodies, I’m looking for something free I can recycle into a basket, or a container of some sort that the recipient is likely to use. 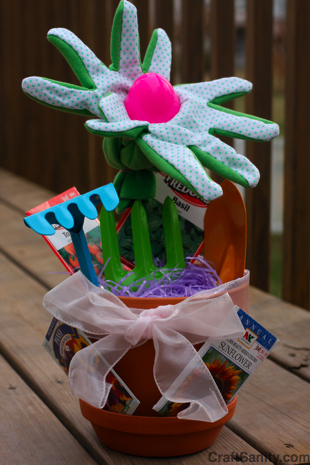 To make this gift you’ll need some garden tools, four seed packets, a pencil or dowel, floral foam, wadded newspaper, a medium sized flower pot, pair of garden gloves (I found some for 75 cents at the dollar store), ribbon to tie around the pot, a large plastic Easter egg, candy to put in the egg, decorative grass, two rubbers bands, pencil or wooden towel, 2-3 lengths of green pipe cleaner, and clear tape. Step 1: Cut a piece of floral foam to fit in the bottom if the pot and poke the garden tools into the foam. Stuff the pot with wadded newspaper to hold the garden tools in place. Cover the newspaper with the decorative grass. Step. 2: Form a flower out of the gloves by sandwiching a plastic Easter egg filled with candy between the gloves with the fingers pointed up. (Tape the egg shut with clear tape to prevent spilling the candy during assembly.) Use a rubber band to secure the gloves around the middle of the egg. Insert a pencil or dowel below the egg, between the wristbands of the gloves, and secure with another rubber band. Wrap the dowel or pencil with green pipe cleaner. Poke into floral foam behind center garden tool. Step 3: Tie a bow around the pot and add the seed packets. Grab a clean plastic tub and a doily measuring 18 inches in diameter. (If you don’t have time to make a doily, buy one from a local craft store for $3.99. Cover your plastic container with craft or tissue paper, so the label doesn’t show through. Then set the covered container on top of the doily and weave a piece of yarn in and out of the lace edge every inch or so. Pull the yarn to gather the doily around the tub and knot in place. To form a handle, cut an 18-inch piece of wire ribbon and loop it through the lace edge of the doily in two places and twist wires to secure. 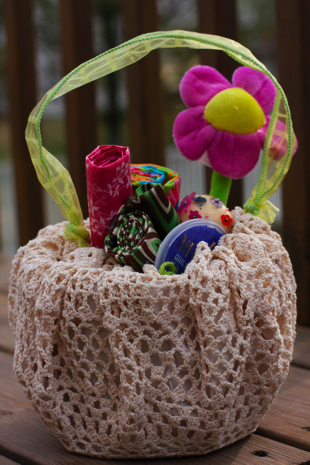 This basket takes less than 10 minutes to make (if you take the doily shortcut) and looks like it took a lot longer. If you happen to hate doilies — and some people do — substitute an 18-inch circle of fabric for the doily, skip the craft paper and gather the fabric using a basting stitch around the circle, folding the raw edge in as you go. For this fabric version, hand stitch the wire ribbon handle in place. Sand Pail Pal: And if you’re looking for more ideas, here’s another one for you. Take a sand pail and fill it with mini puzzles, bubbles and art supplies like handmade jumbo crayons. 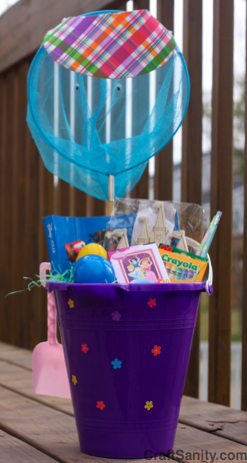 I personified this “basket” by adding googly eyes and a foam visor to the butterfly net. I also added stickers to the pail for added holiday cheer. Now’s Your Chance to Show Off Your Best Easter Craft Idea: I’m collecting some more last-minute Easter craft ideas to share on my weekly craft segment on WZZM Channel 13‘s “Take Five & Company” here in Grand Rapids, Mich. The segment will be broadcast live at 9 a.m. Thursday and the clip will be on CraftSanity after the show. So if you have an idea to share, please send me a photo of your project along with your full name, location and url (if you have one) so I can link and properly credit you for your idea if it’s selected for the segment. The deadline to get your project info to me is noon Tuesday. What’s in it for you? About four minutes of TV craft fame and a mention on CraftSanity.com. I can’t wait to see your ideas! you are in reality a good webmaster. The web site loading velocity is amazing. It sort of feels that you are doing any distinctive trick. In addition, The contents are masterwork. you’ve done a magnificent activity in this subject! Do you mind if I quote a few of your articles as long as I provide credit and sources back to your blog? My blog is in the very same area of interest as yours and my users would truly benefit from a lot of the information you provide here. Please let me know if this alright with you. Appreciate it!